Lions Garden is operated by Rene & Klaske de Leeuw and is located East of Edmonton near Tofield,AB. This 80 acre venue provides everything that you will need for your wedding. They have an outdoor ceremony location complete with built in seating for 140 guests. The highlight of Lions Garden is definitely the rustic barn for your reception. The chandeliers in the barn are something you have to see in person! There is even a Bridal suite for the bride and her bridesmaids to get ready in. The barn comes complete with a professional sound system and wireless microphones so your audio is taken care of. When it comes to your wedding portraits the property has so many great options. It also doubles as a nursery with many different kinds of trees to choose from, there is a vintage car, old iron gates and many other options. What I love about Lions Garden is that you don't have to leave the property at all on your wedding day. It is no secret that my favourite part of wedding photography is the first dance. There is just something about this moment that makes it so special. Maybe it's because whatever stress there was about the day it is long gone and in this moment it ultimately comes down to what a wedding should be about, the couple! 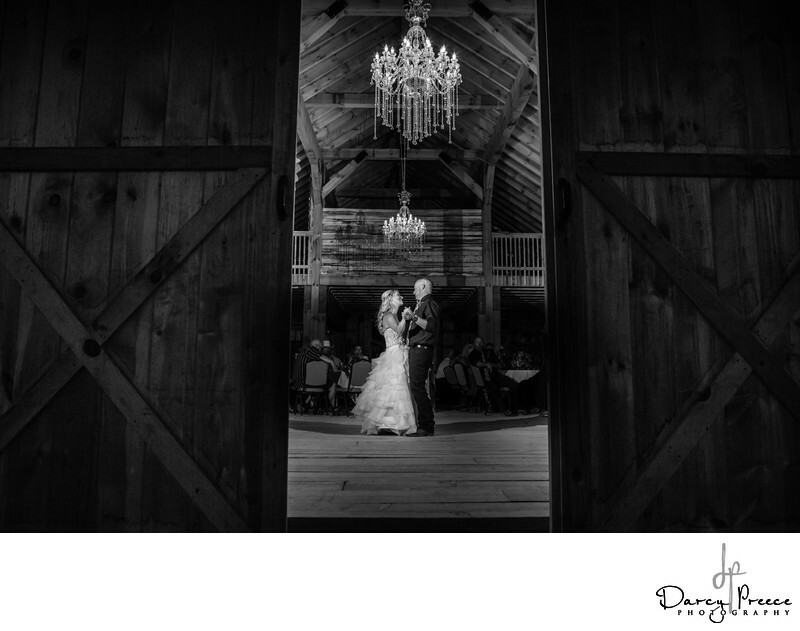 As soon as I saw the barn I knew the image I wanted to create for Becky and Cory's first dance. The sliding doors on the front of the barn would be my frame and the couple would be centred. The only difficult part would be anticipating where they would be dancing and adjust my angle and the doors accordingly. I had asked Becky and Cory to try and stay under the chandelier and they were spot on when it was time to capture the dance. What I love most about this wedding image is the natural look on both of their faces. This image was taken with a Canon 5D Mark III and the lens was a 24-70, 2.8L series lens. There are two Canon speedlites being triggered by Pocket Wizards on either side of the dance floor. When I was post processing this image I knew it had to be in black and white. I feel that it conveys a more romantic feel when you remove the colour and are drawn to the couple. Location: 51115 Range Rd 200, Tofield, AB T0B 4J0.